Fran Olito is the Office Manager at Sgarlato & Sgarlato. She is the go-to person for all office administration and client communications. 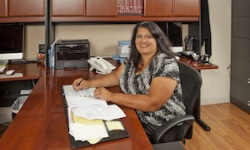 Mrs. Olito, Staten Island Personal Injury Attorney works closely with the firm’s clients and is involved with all claims from start to finish. Daria Hagan is the Bookkeeper at Sgarlato & Sgarlato. She handles all of the firm’s bookkeeping on a daily basis and assists the firm in essential file management.